As we transition into Quarter 3 of 2017, companies are already planning for what 2018 is going to look like. Over the past year, we have seen a lot of change in the business landscape. Amazon acquired Whole Foods and dramatically sliced prices. Apple released not just one, but two iPhones in the past month. President Trump took office at the beginning of the year. Great Britain voted to Brexit from the European Union. Alfred Angelo, a bridal store giant, filed for bankruptcy. There has been innovation, disruption, uncertainty, destruction, and so much more in the business landscape. One thing that we do know for 2018 is that to survive, you must be innovative. Fast Company has already named Amazon to be the most innovative company in 2017, so let’s learn how your company can be more like Amazon. Amazon has impacted how businesses must compete in today’s world. Instead of just competing in one market, Amazon now competes against retailers, grocery stores, logistics, technology providers (Apple, Google), and many more industries and markets. After researching how they have grown, especially over the past 5 years, we have created a list of 7 ways your company can be more like Amazon. NASA has been around for 59 years. In that time, they went through ample amounts of experiments to get people into space… They tested every aspect of the shuttle, the gear, the computers, the communication, etc. While there were thousands of failures, they were the first to walk on the moon. Likewise, Amazon has used the same theory to experiment in many different fields. Ever heard of Amazon Webstore, Amazon Destinations, WebPay, Askville, and Amazon Auction? These are just a few examples of products that Amazon either shut down completely or morphed them into a product more successful. Obviously, you may not have the same cash flow as Amazon does. But that doesn’t mean you do not have the capabilities to conduct an experiment. The most important part of experimenting plenty is to change your perspective to innovate. Start by testing variations of your product through A/B testing. Then test everything! Your product, your processes, your departments, your services, your customers, your placement. Everything. Continue to test until you are pleased with the outcome, then test some more. As technology advances and society changes, things will change more rapidly than ever before. These experiments should never stop. In Amazon’s 2015 Letter to the Shareholders, Jeff Bezos discuses this concept on experimenting frequently. “Most large organizations embrace the idea of invention, but are not willing to suffer the string of failed experiments necessary to get there. Outsized returns often come from betting against conventional wisdom, and conventional wisdom is usually right. Given a ten percent chance of a 100 times payoff, you should take that bet every time. But you’re still going to be wrong nine times out of ten. If you are looking to start experimenting, you need to know what external factors could impact the success of your experiment. Download our External Analysis whitepaper to learn more. When you begin to experiment, you can expect to fail more than you succeed. Once your company has created a culture of encouraging failure, innovation will begin to happen. Thomas Edison, one of America’s greatest inventors and businessmen, once said, “I have not failed. I’ve just found 10,000 ways that won’t work.” Your company can be like Amazon if the leadership encourages each employee to fail. Although that sounds counterintuitive, this aspect has resulted in Amazon’s massive growth. As the financial leader of your company, structure the company’s ability to fail. Because you need to protect the financial future, put in some guidelines for each experiment. Check that they are going to improve something that will move the needle. You don’t want your employees to be experimenting on senseless things – wasting both time and resources. If your company wants to be more like Amazon, you should innovate everything in your company. Ask even the lowest employee why you do things a certain way. If your team responds, “that’s just the way we’ve always done it,” it is time to innovate. There must be a reason for everything you do, and if there isn’t, then you either need to cut that process out or innovate it. Check out Amazon’s product listing that can be found at the bottom of their website. Notice how they cater to various customers, needs, and desires. From cloud storage to groceries to comics to videos and movies to publishing, every customer can find at least one product that they can use. When we say to innovate everything, we mean everything. Amazon is continually updating, improving and innovating their systems and products to better serve… Their customers! Now, providing various products does not necessarily work for every company – and it shouldn’t. But Amazon has made the web their playground and has innovated everything related to the web. Find your playground and start innovating. One thing that has set apart Amazon from the rest is their customer centric, customer obsessed culture. In a Forbes interview with John Rossman, a previous executive at Amazon, he said that “there are 14 leadership principles at Amazon. They weren’t written down, they weren’t codified when I was there, but you saw them being used every day. The first one is ‘Obsess over the customer,’ and the 14th is ‘Deliver results,’ and there’s 12 in between those two.” To get results, you must start with the customer. A business can have all the best processes, accounting, logistics, etc., but if your company does not have a customer, it doesn’t exist. Change for some can be uncomfortable. Even those that thrive on that adrenaline pumping adventure, some change can feel like walking on a tight rope across a canyon. Get out of your comfort zone when you are innovating. Just because you are in the financial leg of your company doesn’t mean you need to stay there all the time. For a company to be effective, every employee needs to be involved in every aspect of your company. For example, you should be concerned how marketing is spending their budget. Marketing, likewise, should be wary of how their decisions impact the bottom line. Your company can be more like Amazon if you base your strategy on reliable facts. While this seems like a simple task, many companies base their strategy on what they want to outcome to be… Not on fact. At re:Invent 2012, Jeff Bezos elaborated on why you need to base strategy on reliable facts. “I very frequently get the question: ‘what’s going to change in the next 10 years?’ And that is a very interesting question; it’s a very common one. I almost never get the question: ‘what’s not going to change in the next 10 years?’ And I submit to you that that second question is actually the more important of the two – because you can build a business strategy around the things that are stable in time….in our retail business, we know that customers want low prices and I know that’s going to be true 10 years from now. They want fast delivery, they want vast selection. For your company to be successful, you need to start identifying what is going to be true ten years from now. They are going to want a better product or service. Your customers want to get that for a lower price. And they want value. Once you write down the facts, you can strategize your company’s next move. Obviously, we are not going to recommend that you innovate or experiment without having thought it through. In fact, you need to prepare before you begin the experiment. Remove any known risks associated with that experiment and be aware of any potential risks that could come about. 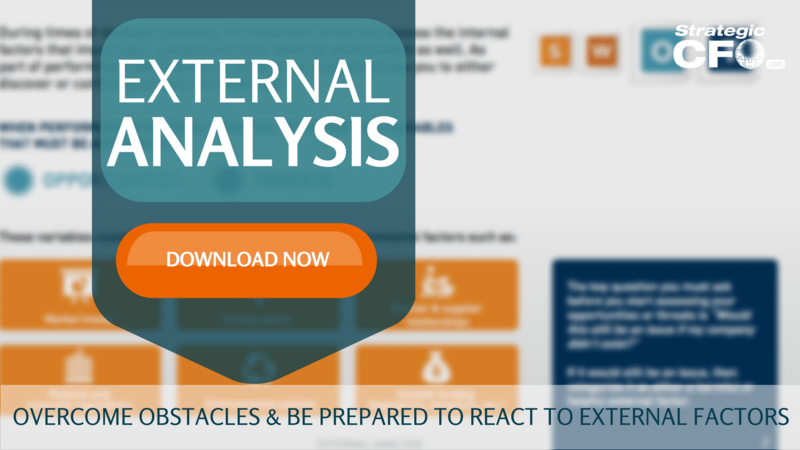 Create an External Analysis to overcome any obstacles that come your way and be prepared to react to those external factors. Although you may not be able to prevent those obstacles from occurring, you can prepare how you are going to react to them. Download our free External Analysis whitepaper to gear up your business for change and your company can be more like Amazon. Most would agree that there is risk associated with pretty much everything that we do. There is a certain level of risk when we drive to work, close a sale, sign off on your subordinate’s work, etc. But knowing that there will always be some risk, we are able to better prepare for it. Lawyers and insurance companies rely on the black and white of contracts to protect themselves. So, to protect yourself, make sure that all your contracts include an act of God and force majeure clauses. Theses clauses protect you from any event out of your control. It is like putting on your seat belt when driving… The risk associated with not doing so is too high not to wear it. Force majeure is a superior force that acts against the best interest of the company. The Entrepreneur’s Guide to Business Law claims that force majeure is “used to designate problems beyond the reasonable control of a party”. In the case that there is a contract between two entities, this clause allows both parties to be freed from any obligations when extraordinary circumstances prevent one of the entities from fulfilling their end of the contract. These events must be unforeseen and/or unforeseeable. For example, you have a restaurant with contracts and/or promises with vendors to purchase a certain amount of goods. A riot destroyed the property, forcing you to temporarily shut down the facility, this would free you from any obligations set up in the contract. This riot was out of your control. As a result, you were required to shut down for a period. In addition to events such as a riot, crime, event, war, strike, etc., there are acts of God that tie into the force majeure. So, what’s the difference between force majeure and acts of God? Simply put, force majeure is a human caused event. In comparison, acts of God are physical events that natural occurrences cause. The force majeure can be related to human, political, and/or movement issues. These events can cause severe financial dents in companies, if those clauses are not in writing. Why not? These clauses protect your company when it is at its weakest and when it is unable to conduct business like normal. But it is critical when writing these clauses that you include every type of event that could impact the operation of your business. The wording “but not limited to” can be used in a court of law to dispute any claim not written in ink. As a financial leader, guide your CEO, COO, and legal team to identify potential forces that would disrupt business. First, access your free How to be a Wingman guide! This free whitepaper will coach you how to be a trusted advisor. Over the past six months, BHP Billiton had imposed, enforced, and lifted a force majeure. They had originally exercised their force majeure clause because the workers in their coal mine in Chile went on strike for 43 days. Therefore, they could not fulfill business deals and contracts. This clause protected them from lawsuits, etc. This Chile strike cost the company $1 Billion without it being their fault or in their control, but the damage could have been much worse without the force majeure clause in their contracts. Typically, those in charge of financial functions try to avoid risk at all costs. These clauses mitigate the legal risk associated with physical or natural events. By spreading out and minimizing the risk with this clause, an actual situation becomes a lot more management… Both financially and legally. What happens when these events occurs? When these human-related or natural events occur, it’s critical to have a game plan (and even better to have the plan prior to it happening). Brainstorm with your team and while you’re in negotiations with the other party about what each scenario would look like. Imagine that a hurricane destroyed your warehouse holding all the supplies. What percentage of the product would still be functional and in good condition? How long would it take to rebuild the building, recover damaged goods, and start distributing again? What order of actions would you need in the case of these events? These questions indicate the potential financial implications of an event like this. By answering these questions, you and your team will hopefully identify the costs associated and calculate the length of time and the profits lost during that time period. At some point, you need to lift the force majeure. As the wingman and financial leader, calculate when would be the prime time for the company to resume conducting business again. As entrepreneurs, we are taught to create a minimum viable product and/or be a lean startup. With that know how, what is the earliest that you can start operating, even in a small way? It is not intelligent to suspend the force majeure only when everything is back to 100%. The company would risk running out of cash, the patience of Party B, and going out of business. What happens if this event extends longer than expected? There are some cases that an event lasts longer than originally expected. Set up KPIs to track the progress of the resolution – both externally and internally. Notify legal, executive, and the other party with a revised plan of action and/or projections. In times of uncertainty, your executive team can be blinded by the distractions of events and/or reactions of the company. Be the eyes and guide them using the financials. 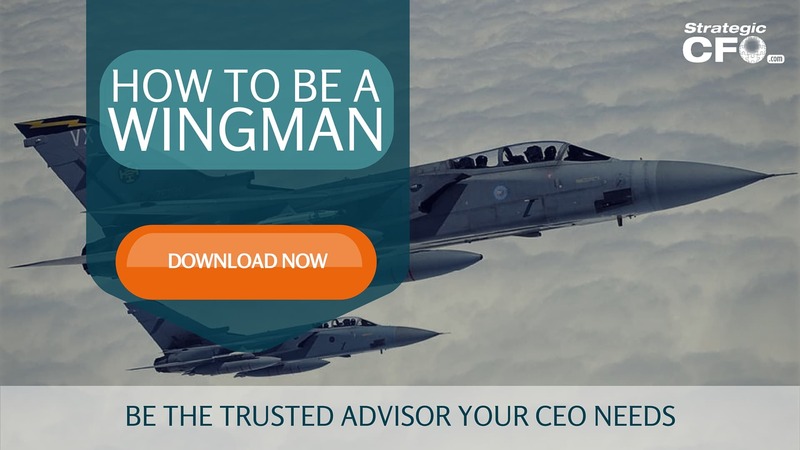 The ability to be the wingman or trusted advisor your CEO needs will get the company out of harm’s way, elevate your status, increase the amount of trust, and steer your company to success. Download our free How to be a Wingman guide today! One common perception is if most sales projections fail, why do it? As you probably know, sales forecasts are used to predict a certain amount of revenue over a given period of time. Whether this is based on a gut feeling or on historical data, the worst thing you can do is over-promise and/or under-deliver. Projecting revenue is essential. Two weeks ago in our blog, How does a CFO add value?, I mentioned the three legged stool analogy. If your sales fall short of projections, you’re going to run into some issues with respect to cash flow, inventory, or a lack of resources. Whether you are releasing a new product or are continuing to project growth in your sales, it’s imperative that your sales projections are accurate. Sales managers and CFOs normally have different perspectives, mainly because their roles contrast greatly. The sales manager is often more concerned about his or her team and maintaining customer relationships. They’re also generally fairly optimistic (sometimes overly so) in their projections. The CFO looks at the bigger picture. They move 3-5 months faster than sales people or accountants, because they’re forward-thinking and continuously making plans on how to improve the company as a whole. This often leads to conflicting predictions with the sales force. For example, Bill (the CEO of ABC Company) asks Steve (the CFO of ABC Company) what he projects sales to be in the next quarter. Based on previous performance, Steve predicts about $3.8 million, because last quarter they generated $3.7 million. That’s about 2% higher than the actual revenue generated, which is reasonable considering their historical record. But then Steve the CFO asks Ben, the Sales Manager, what he thinks. Ben’s top salesperson, Lillian, performed over 40% better this quarter compared to the previous quarter, and he expects her to positively influence the sales team with her success over the next quarter. Ben optimistically projects $4 million, which is almost 8% higher than last quarter’s revenue, and 6% more than Steve’s projection. When you increase revenue by just 2%, the bottom line also increases by a substantial amount. When comparing the bottom lines of a 2% increase in revenue versus an 8% increase in revenue, which would you think is more realistic? And which number would you accept as a CFO? Let’s look at a more recent example. Let’s refer to the Apple Watch situation last year… Apple optimistically projected to sell 41 million watches. Shortly after releasing the product, analysts altered that projection down to 31 million. Pretty soon, Apple decided to be a little more realistic in their projection. Thus, they reduced it yet another 10 million. Why do you think that is? 1. Their “gut” feeling was poisonous. It’s natural for a company to be excited about the release of a new product. They were absolutely ecstatic that this product was finally going to launch. This positivity created a bias for future projections because they were the only ones formulating this prediction, not an outside group of differing opinions. 2. The idea that a new product equals new data. “We don’t need to check our historical figures because this product never existed in our company before, right?” Wrong. True, this is a new product. However, there are other ways of comparing and predicting your sales. For example, if I was the CFO of Apple, and Apple Watch decided to launch a new app, I would look at similar, previous apps that cost the same for marketing, production, and other direct costs associated with the app. It’s common sense – how much can you usually afford to produce? Apple quickly saw that their projections were wrong and just as quickly adapted. But companies that are worth $10-100 million can’t necessarily afford to be 20 million units off of their projections. A projection that wrong could have easily put a company without the resources of Apple into the grave. Although Silver is analyzing financial crises, the same analysis applies when we look at sales projections of a mid-size business. The most important factors you have to calculate are risk and uncertainty. If you neglect to consider risk and uncertainty, you are most likely over-shooting your projections. People often overlook risk and uncertainty when projecting revenue. However, life happens every single day, leaving you with failed projections. Most projections fail due to inability to calculate these two factors: risk and uncertainty. So where do you start in assessing risk and uncertainty? For uncertainty, identify those events or situations that you are not sure of. Acknowledging your ignorance is key in this situation. It allows you to put focus on places where you are not sure. Uncertainty is not the same thing as inaction as many business or financial leaders like to define it. That’s an important distinction that you must continue to remind yourself of when analyzing what risks and uncertainties your company is facing. By completing a SWOT analysis, you’ll be better equipped to understand where risk and uncertainty is found within your company. If the problem is either over-shooting or under-delivering sales in their projections, then the answer is relatively simple but is often overlooked. The Goldilocks Sales Method will help you project revenue that is not only more accurate, but will help you utilize your projections. Access your Sales Genie Execution Plan in SCFO Lab. The step-by-step plan to build your sales pipeline and project sales that will improve profitability and cash flow.